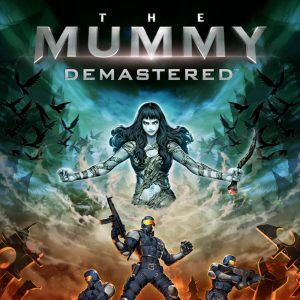 The Mummy Demastered is a licensed game based on the the 2017 movie “The Mummy”, which is releasing on Steam, Xbox One, Playstation 4 and the Nintendo Switch. We have little clue in how the story of the game blends in with the movie, as we are unfamiliar with the movie ourselves. 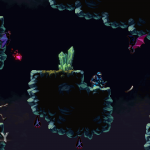 However, the gist of the game is that you are an agent of Prodigium on the task to defend mankind from the supernatural hordes of Princess Ahmanet. 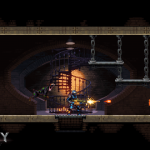 Generally though, the story is kept light and the game focuses on the gameplay. 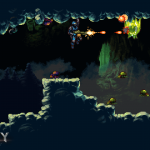 As the title of the review implies, the game is a mix between Dark Souls, Contra and Metroidvania. 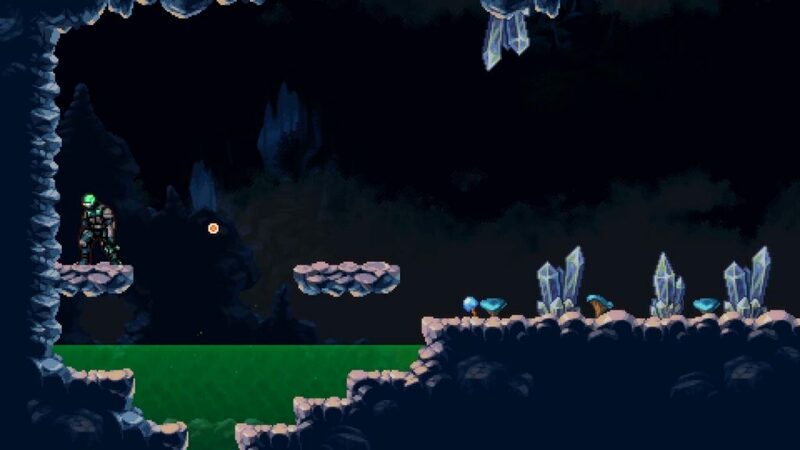 The world, environment and progression are reminiscent of Metroid or Castlevania, the combat invokes nostalgia of Contra and the game is very difficult and since Dark Souls has invented difficulty in video games, this game ends up being like Dark Souls as well. Now, let’s figure out how good this game is, if it is for you and when and at what price you should buy it. To do so, we’ll crunch this game through our unique value-based review system. Generally, while story is of little importance to us, the atmosphere of a game is. A good atmosphere can make or break a game and its quality is usually a great indicator on the absolute value of the game. 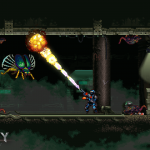 The Mummy Demastered looks like something that would run on the SNES, as its artstyle is of the 32bit quality. Its music however is modern and together with the artstyle, the grim and dark aesthaetic is set. While this game is far from being a horror game, you can really feel the terror within as its gameplay actually enhances the atmosphere. 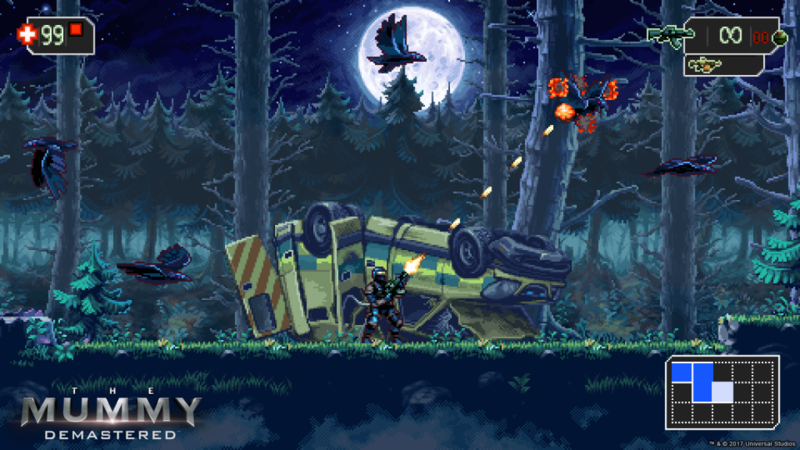 The game is hard; the enemies do a lot of damage, take a lot of damage, move fast and sometimes even spawn infinitely. Further, you can only save your game at save points, which you have to find when traversing through the worlds. This implicates a constant sense of danger, as you could die at any given moment if you are careless. However, you never actually lose your progress when you die. 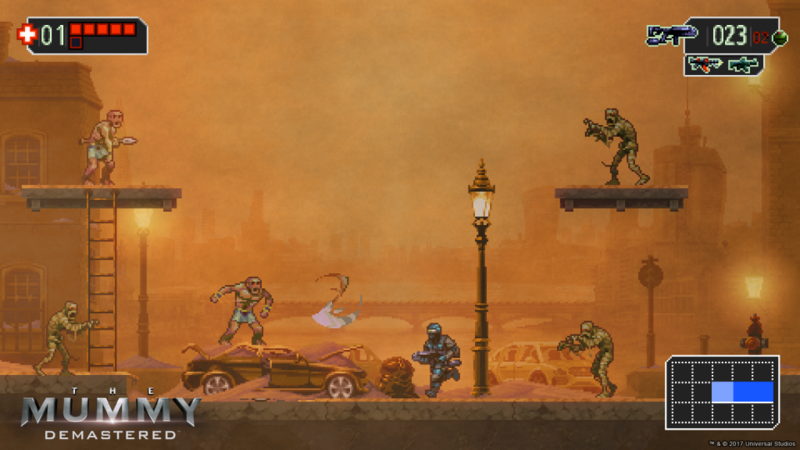 Instead, you turn into a zombie and are now an enemy to the agent that replaces you. Now, as the next agent, you will want to obtain the gear that the previous agent had. To do so, you will have to defeat the now undead agent and take the gear off him. 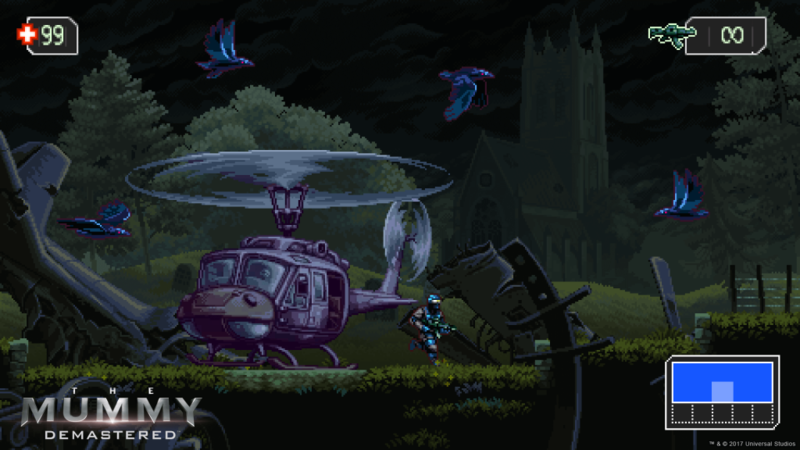 Effectively, this is a corpse run where the corpse fights back. This can actually work quite well in some situations and add to the intensity and dread in the game. It adds another incentive to stay alive, as you are much weaker without the additional gear and it gets harder the further in the game you are. However, in other situations it is really bad and frustrating; for example if you die in a spot where you are already overrun by enemies. … which you’ll then have to defeat to get your stuff back! 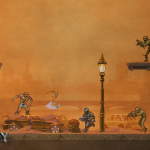 What now happens is that in addition to the enemies which already outnumbered you, you will now have to also fight the fully geared zombie version of your soldier without any gear on yourself whatsoever. As you can probably imagine, this lead to frustrutation and only with luck were we able to defeat the section this occurred in. What’s worse, if you die again another corpse appears and with each failed attempt you get more versions of yourself to fight against. Imagine that this can happen at spots where enemies spawn indefinitely and you have a recipe for disaster. To take note here, there seems to be a limit on how many corpses can be on a single spot so avoid thinking that you’ll end up in a neverending spiral. 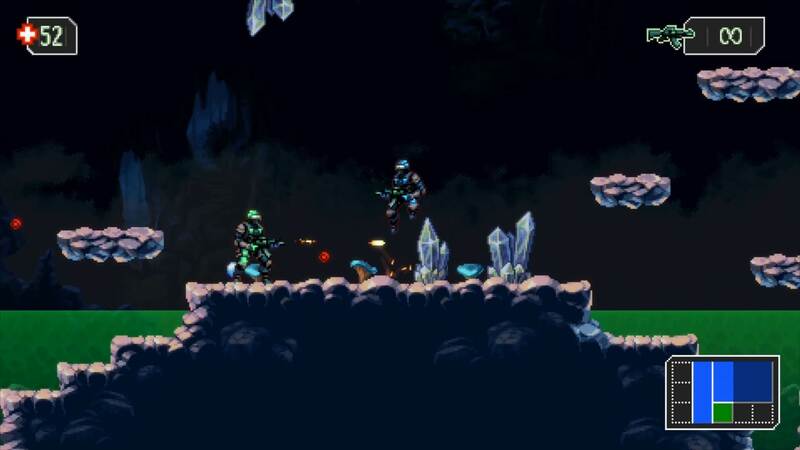 Looking at the game, one can clearly see the similarity of the game to Contra as the game contains platforming and shooting in a 2-dimensional space. By holding down the trigger buttons, you can stand still and shoot in up to eight directions, up, down, left, right and the diagonals. 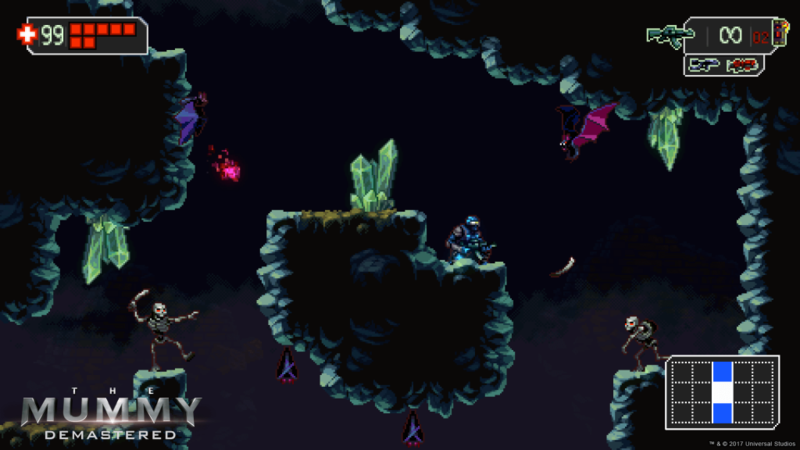 Along with the fairly standard platforming this forms the basis of the gameplay. We actually experienced a bug here though when we played with a keyboard on PC. 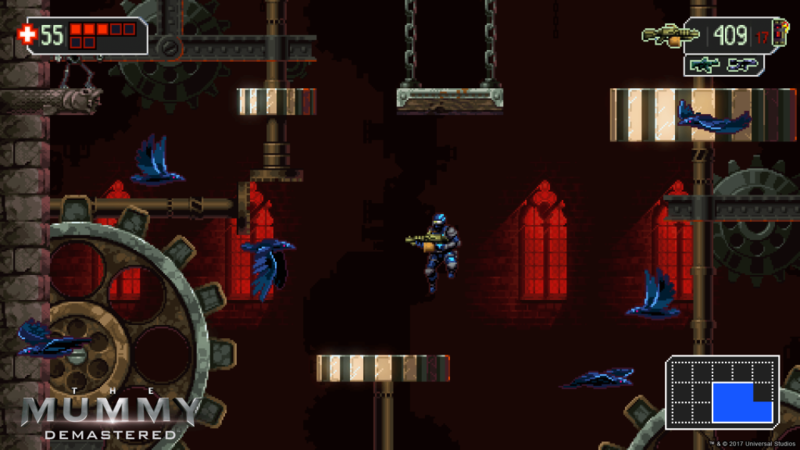 Here we ended up being unable to aim weapons towards the upper-right, lower-right and lower-left corners. Generally, while you are going to your objectives, you will be taking a look at your surroundings to try and find upgrades for your character. On these you usually have to break open a gate with an explosive. Here is one light critique point from our side. The first few gates that you break open are wooden and afterwards you will see some that are made of metal. 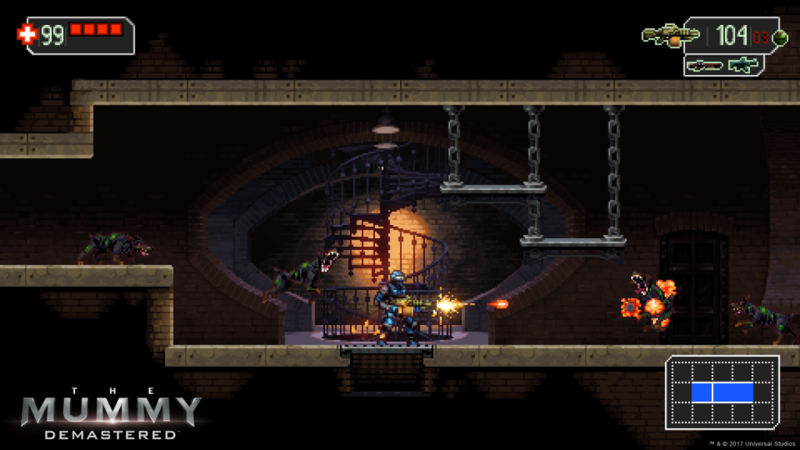 Your first instinct would be to believe that you are unable to break open the metal gates with your explosives and will require an additional upgrade for that; you are playing a Metroidvania game after all. However, you actually are able to break open the gates with an explosive and the visual cues the game gives to you are therefore misleading. 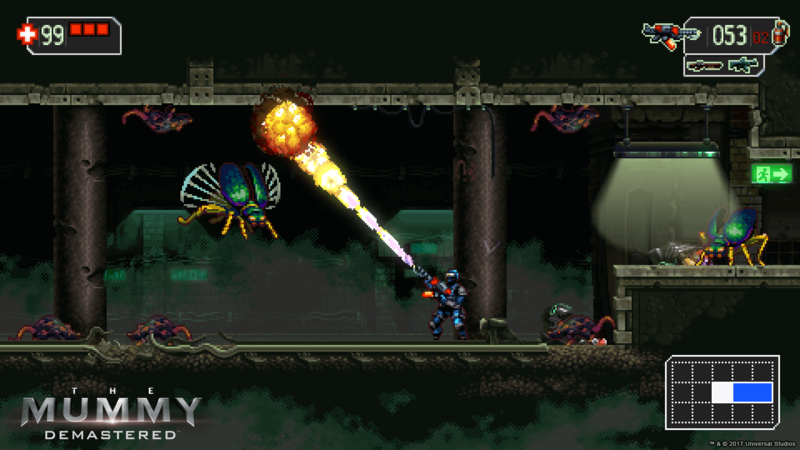 The weapons themselves serve as a stronger alternative to your standard infinite-ammo machine gun, but have limited ammo. Because the soldier you play can only use a set of three weapons, any additional ones you get will be stored away and accessible within weapon rooms. You can adapt your equipment to your playstyle or the enemies you are facing. Guess the game is like Team Fortress 2 too as you can cosplay as the Pyro. In terms of length, your main playthrough will probably be between 6h to 10h, depending on how well you do with the game. 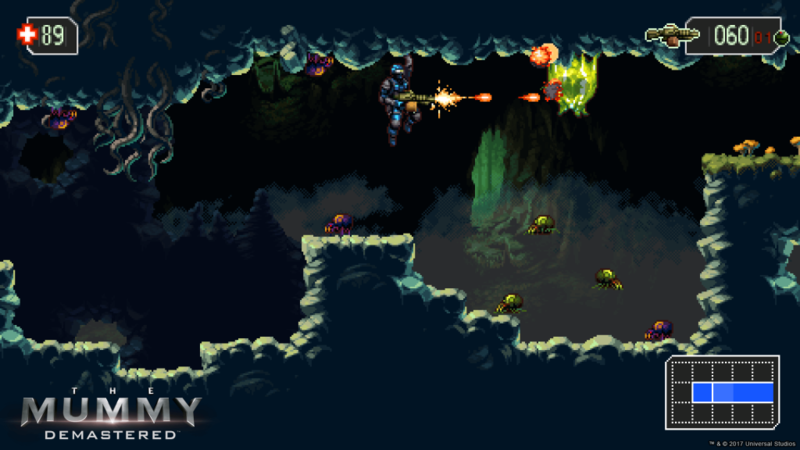 A completionist approach will take quite a bit more time, as there are weapons and relics to be found. However, this playtime is worth a bit less than other games, as you will be replaying quite a few sections a lot and that adds up in playtime. The game is in some cases quite fair; every single enemy has a pattern which you need to learn. After you’ve learned the pattern, you can try to find a way to counter it and you will usually get quite good at doing so. While this is generally really good and indicates that the game is of high quality, these patterns are very tricky to handle with multiple enemies at once. 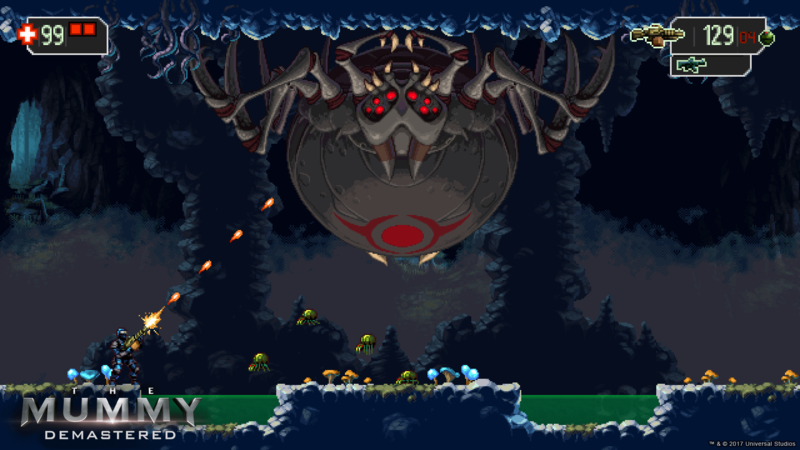 Especially as some enemies spawn indefinitely, you are unable to tread through the level all too strategically and kill them off one by one. What can really be said about the gameplay is that it is very hard. You will probably die quite frequently and will have to make a corpse run. 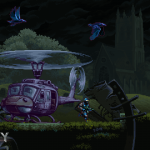 Sometimes it may even be a better option to just get to the end of the section as fast as possible due to some of the enemies being able to respawn indefinitely. The fairness of the game is further evident from its boss fights. These are quite long and can really be considered as endurance fights. 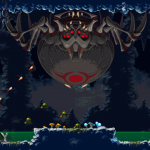 Once you learn the boss’ patterns, all attacks become predictable and you have to make sure to avoid the damage he deals over a prolonged period of time, while you yourself attack the boss. The boss fights are therefore very enjoyable as they are hard but fair. It will usually take a couple of attempts to beat them, but the satisfaction you get from doing so makes it just that much better. Our biggest critique point of the title would be its health system. 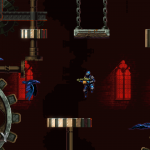 The game is void of any health rooms, which means you are left to grind health by exiting and reentering areas and destroying some props to regain it. This also means that health upgrades are near pointless, unless you are willing to grind for your hp. Health drops also never increase in their capacity, which is just another downfall of the system. Especially for boss fights this system is plain stupid. When you die at a boss, you get to fight your previous corpse in the room before the boss. There, you’ll regain some health after defeating it but never all of it. This means, you can either go fight the boss with a lot less health or you grind your health back. The most efficient way for us ended up being to grind our health back to full once and then actually quitting the game right before we died, because a death would save the game. This meant, we kept our high hp and avoided fighting our corpse on our next attempt saving us precious minutes on each attempt. This grind is quite frankly a waste of time and if you are able to simply play the system this way, it is actually a very bad system. 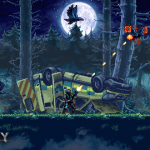 If you were simply to be fully healed you when defeat your previous corpse, the grind would disappear and a much better synergy with the corpse run mechanic would be achieved. As an alternative, putting a single, well-hidden medical room per level might also mitigate this issue while draining very little of the intended difficulty. This grinding actually ends up hurting the value of the game, as we want to discourage developers from padding out the gameplay with boring and tedious sections. At Red Value Gaming, our review scores work a bit differently than elsewhere. Here we assign a game a value at which we think the game becomes worth buying in addition to a standard review score, which are both evaluated seperately from another. The traditional review score is pretty standard, but anything to do with the game’s business like microtransactions or the game being short is moved into the value rating itself. This allows our score to be a direct reflection on how good the game is, while the value rating will still be able to warn you if the game has any sort of sketchy business surrounding it just from the review score alone. So in total, we value the game at around $13, which puts it at about 2/3rds of its MSRP. The game has a decent soundtrack, atmosphere and gameplay, but is bogged down by its issues and especially the grinding. Taking a look at the developer’s previous game Shantae: Half-Genie Hero’s pricing history, you can probably expect an around 20% discount during the X-mas sale on Steam. If you disagree with the game or want to state yourself on how much you would pay for the game, vote on how much you would pay for the game further down below just above the commenting section. In conclusion, we actually quite enjoyed the game as its toughness made us really learn the game and we ended up feeling quite accomplished when we finally beat it. However, due to the issues with the corpse run and the health system, we’re unable to give this game a rating higher than 77. 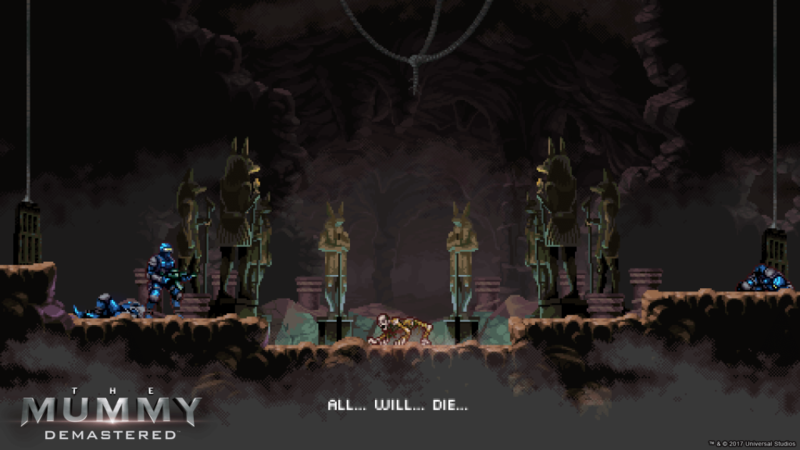 If you like tough games that will really make you grind your teeth out and are ok with the grind, you will enjoy The Mummy Demastered. If you prefer a relaxing and easy-going experience instead, you should skip over the game and go for something like Shantae Half-Genie Hero, the developer’s previous game, instead. All in all, thank you so much for reading and if you enjoyed the review, consider subscribing to us on YouTube, liking our Facebook Page or following us on Twitter to stay up to date with our stuff. Maybe even leave a comment; we’re looking forward to reading it! 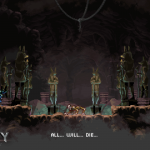 If you like tough games that will really require you to learn them and are ok with a bit of grinding, you will enjoy The Mummy Demastered.